Seldom do you see a top-level player considered more significant by his country than his club, yet this is the predicament that Olivier Giroud faces at Chelsea and has suffered for a few years. Despite failing to score in Russia, the experienced forward was integral to France’s notable World Cup success, with his physicality and link-up play affording his teammates the freedom to impress. Since returning to Chelsea, he isn’t afforded the same authority as Didier Deschamps allows him to have. He has continued to be a peripheral figure, the second in command, initially behind Alvaro Morata, and now Gonzalo Higuain. The 32-year-old has only started six of his 21 league appearances this term, and since Higuain joined Chelsea in January, he has yet to start a league game, with Sarri opting against introducing him in four games (Huddersfield, Manchester City, Fulham and Wolves). Despite his limited league involvement, and the fact that he’s approaching the latter stages of his career, Giroud still has a role to play at Chelsea; best evidenced by his Europa League performances. In nine Europa League games, the Frenchman has contributed towards 11 goals, scoring nine (the highest individual total in the competition) and assisting two. Granted, the Europa League is not the level of football in which Chelsea nor Giroud aspire to, but when he’s featured, he has impressed – which doesn’t apply to many Chelsea players of late. Currently, Giroud has totalled the third highest amount of goal contributions (17) in the Chelsea squad, only bettered by Willian (20) and Hazard (27), both of whom have been more significantly involved for the Blues this term. The Frenchman’s contract expires this summer and, given the impending transfer ban that Chelsea face, it’s highly plausible that the Blues will opt to extend his it. Irrespective of said ban, however, the 32-year-old’s contract should be extended. Fundamentally, and without ignoring several underwhelming results, Chelsea’s issues have stemmed from woeful performances. Possession football is utterly meaningless without penetration or purposefulness. Chelsea have become monotonous and predictable, devoid of imagination and flexibility; a source of considerable frustration for the Stamford Bridge faithful. Crucially, Giroud provides an alternative to the possession-based style that Sarri is hellbent on establishing at Chelsea (to no avail so far). This isn’t to dismiss Giroud’s utility in Sarri’s system, he’s a capable passer, and he links play well with his close control and one-touch passes. However, his primary strength lies in the air, with his ability to dictate aerial duels and attack the ball. Eden Hazard has previously labelled the Frenchman as the world’s best target man, and the act of introducing the striker can markedly alter a team’s style of play. Amidst his experience and selflessness, the former Arsenal forward provides tactical adaptability, a pronounced plan B, and a practical point of reference. Jorginho’s utility has often been stifled by opposition teams this season through sharp and targeted focus; Giroud alone enables Chelsea to transmute their game plan, which is mightily effective, mainly when plan A has been so problematic in its institution and evolution. Critics will rightly pinpoint his deficient goal-scoring record in the Premier League, he has only scored once this season, but it’s challenging to make the desired impact when devoid of continuous involvement and the unwavering trust of your manager. Remarkably, Giroud scored a hat-trick and registered an assist during Chelsea’s 5-0 demolition of Dynamo Kiev, and Sarri trusted an ill Higuain to start over the Frenchman in the 2-0 defeat to Everton. Chelsea have scored the fewest goals out of the league’s top-six and have hit the woodwork more than any other team in the division (19 times). 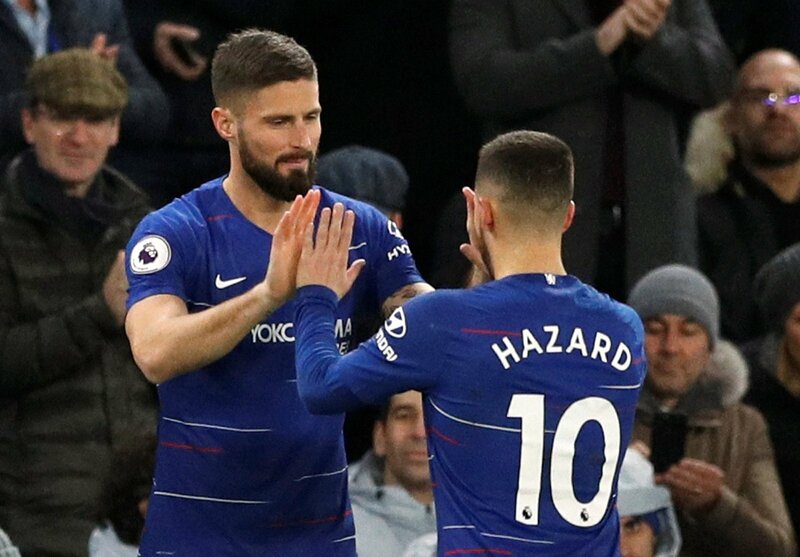 Resultantly, Giroud alone isn’t the answer to the Blues’ goal-scoring woes, yet he has demonstrated his effectiveness to Chelsea this season, and if he was used more astutely by Sarri, then conceivably, he could improve his contribution to the team. Giroud has shown his importance to Chelsea; he should be rewarded accordingly.